My friend Annie is an international tour guide (that's right. Her job is an international tour guide.) She's finally settled in New York, where I have no doubt she will do something fearless with her amazing self. 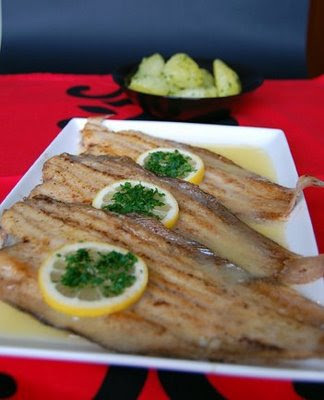 "It arrived whole: a large, flat Dover sole that was perfectly browned in a sputtering butter sauce with a sprinkling of chopped parsley on top. The waiter carefully placed the platter in front of us, stepped back, and said: "Bon appètit! I closed my eyes and inhaled the rising perfume. Then I lifted a forkful of fish to my mouth, took a bite, and chewed slowly. The flesh of the sole was delicate, with a light but distinct taste of the ocean that blended marvelously with the browned butter. I chewed slowly and swallowed. It was a morsel of perfection." I made it and was shocked at how easy it was. A light piece of fish dusted in flour and seared in a butter bath. I served with roasted broccoli and roasted sweet potatoes. Heat a large saute pan over medium heat. While the pan is heating, fill plate with flour and season with salt and pepper. Pat the sole fillets dry with a paper towel. Sprinkle one side of each fillet with salt. Then, coat both sides of the fillets with the seasoned flour. Add 3 T. of the butter to the saute pan. Once the butter starts to brown, place the two of the fillets in the pan. Cook for 3 minutes on medium low. Turn the fish carefully with a large spatula. Add half of your lemon juice (about 2 T.) and 1/2 tsp. lemon zest to the pan. Cook fish an additional 2 minutes. Carefully remove fish from pan onto an overproof plate. Pour the sauce over the fish and keep warm while you repeat the process with the other 2 fillets. To serve, sprinkle with parsley, salt and pepper. Serve immediately.